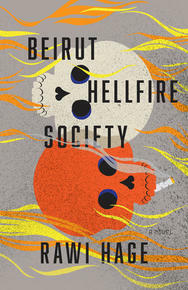 Trevor Corkum: Beirut Hellfire Society is a blistering, mournful, tender howl of a book. When did you first realize you had a novel on your hands? 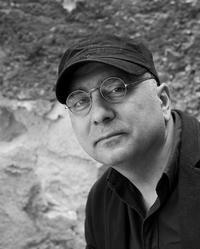 Rawi Hage: When I wrote the first sentence. TC: Can you share some of the creative struggles and challenges that went into the writing? What motivated you as you moved through revisions? RH: The challenge for me is to actually start the writing. Once that’s initiated, I find a momentum and then things tend to accelerate. It’s always the slow start that is a challenge for me. TC: One of the central themes in the book is the question of mortality. Pavlov, your protagonist, is an atheist, who nevertheless as a member of the Hellfire Society celebrates life (and death) through elaborate rituals of dancing and fire. Do you believe anything exists for us beyond our physical deaths? RH: No. I like to think that things end. It makes everything good that we do in our lives more brave and dignified. To give without the expectation of reward in the afterlife allows us to have the ultimate kind of humane, participatory existence. I like to think that things end. It makes everything good that we do in our lives more brave and dignified. To give without the expectation of reward in the afterlife allows us to have the ultimate kind of humane, participatory existence. TC: You’re also a photographer. There’s a photographer in the book who takes pictures of bombs dropping and catalogues the destruction and aftermath of war. Can you talk more about the connection between photography and writing in your practice? RH: I often approach or imagine a scene as a set-piece or a frame. But I also tend to place myself in close proximity to that frame and carefully look at the details in the scene. Then I project its meaning, be it historical, political, or simply existential. I see all things in the frame as having a relationship to each other, be it symbolic or narrative. I tend to create short maxims out of everything I encounter in that particular frame. I think that’s what a photograph is: a maxim. And I imagine chapters as framed scenes. TC: There are rich explorations of debauchery and sexual libertinism in the novel. The human sexual libido manifests as a fierce affirmation of life, a way of being fully present in the beautify tragedy of the here and now. Sexual surrender is also a militant act of refusal, a defiance, like the powerful scenes of dancing and howling. Why do you think there is such a fear of the body, of corporeal pleasure, in literature—perhaps in CanLit, in particular? RH: I think that fear has a theological basis. The three main Abrahamic religions, in particular, have a thorny relationship with the body. If we examine the dietary restrictions, codexes on genetics, and certainly specific instructions about sexuality and taboos in these religions, we find that all of this is related to the corporeal. Modern Christianity has eliminated some of the prohibitions, but it still highlights the necessity for corporeal pain—hence the glorification of the crucifix, for example. As for CanLit, I can't really say. Perhaps it is true that some CanLit is still affected by its Victorian roots. I suspect Quebec Literature doesn’t have that particular problem. One sunny day at the start of a ceasefire, a father drove with his son down towards where the fighting had been. A cadaver had been lying on the ground for days, mutilated. The son, who was named Pavlov, and his father, an undertaker, loaded the remains into plastic bags and carried them to the hearse. The cadaver’s belly had been opened by a bullet wound and vermin had claimed it and multiplied inside the soft organs, gorging on the entrails. Father and son gathered the scattered items that belonged to the dead: a loose shoe, a bag filled with mouldy food, broken glasses. They arrived at a secluded area in the high summit, and finally at a small stone house that looked to be abandoned. But the father picked up a key from under a potted plant, opened the door, and together he and his son entered. The house was simple and humble, cold and damp. Neglect and dust could be seen everywhere. The floor was bare, and through the soles of their shoes father and son felt the touch of leather against grains of dirt and sand. Walking across the room was slippery but manageable—two pairs of feet grinding little particles into the floor. The walls of the house were peeling, exposing straw mixed with clay, an ancient technique for efficient insulation that the villagers had used for centuries. There was a bed in the corner of the main room and, in the middle, a stove with a chimney that extended its charcoal tube towards the ceiling before the cylinder shifted at the end, a perfect ninety degrees, to reach the top of the adjacent wall and cough out its smoke. Welcome to the Society’s mansion, the father said. Pavlov followed his father into the second room. This was a later in addition to the house, separate from the main area. Its cement floor was bare and unpolished and the room’s main feature was a large metal door in the centre of the back wall, well a smaller door beneath the large one. Beside the doors, two large gas tanks were linked by tubes. To Pavlov’s eye, they resembled the garden, hoses often seen training like serpents around villagers’ houses. Excerpted from Beirut Hellfire Society. Copyright © 2018 by Rawi Hage. Excerpted by permission of Alfred A. Knopf Canada, a division of Penguin Random Canada Limited, a Penguin Random House Company. All rights reserved.